1 What Is Face Pain? If you’re suffering from face pain, you know how it can affect every part of your life. Struggling with this condition is difficult, but there are treatments that can help. Here’s what you should know. The pain is typically throbbing, sharp, or aching. Some patients describe it as a feeling of pressure and tingling in the face. Facial pain is, unfortunately, a common occurrence. In fact, it is one of the most frequent reasons that people visit outpatient clinics and emergency departments. Injury or headaches are the typical causes of face pain; however, other conditions can also be responsible for the pain. For example, pain felt in the face can originate from another location within the body, which may be caused by a variety of potential medical conditions. Face pain caused by migraine headaches can be extremely debilitating. This type of pain usually presents as unilateral throbbing in certain areas of the face. Another cause of severe facial pain is known as trigeminal neuralgia, as we’ll discuss shortly. When clinicians assess a patient for face pain, they often rely on a variety of diagnostic tests to help understand what’s causing your pain. Current research has revealed that approximately 45,000 people suffer from trigeminal neuralgia. Alterations in the neurological structures, due to damage or inflammation of the trigeminal nerve, lead to this severe form of pain. 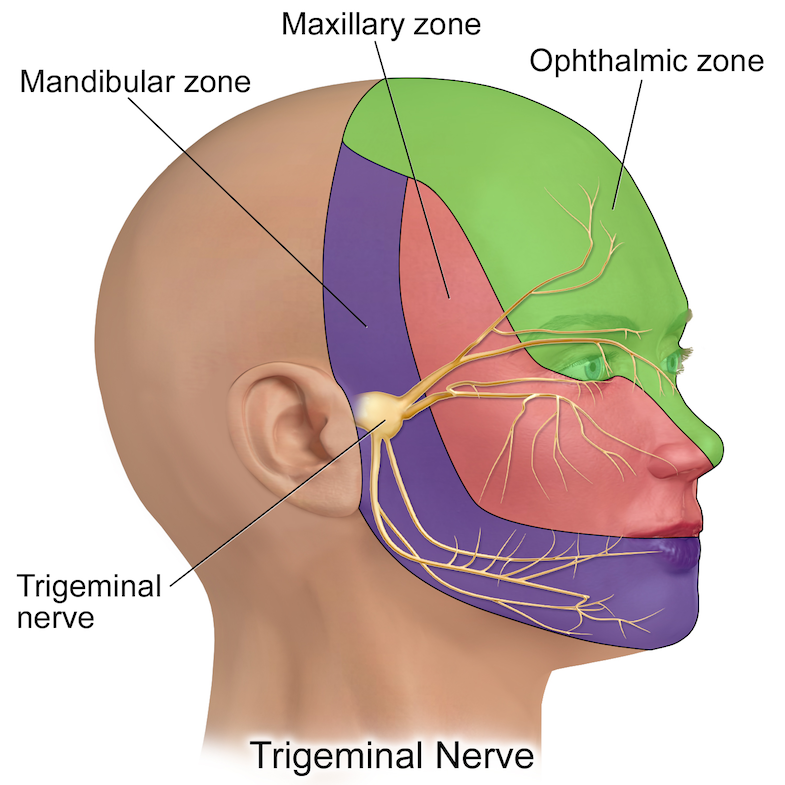 For those suffering from trigeminal neuralgia, blood vessels apply pressure on nerves near the base of the brain. This pain can be so debilitating that patients often are unable to perform simple daily functions, such as walking, eating, and, in some cases, talking. The face pain treatment your doctor ultimately decides on depends on the cause of your pain. For example, headaches are usually treated with non-steroidal anti-inflammatory drugs (NSAIDs) or other pain relieving medications first. In more severe cases of migraine headaches, physicians may prescribe Botox injections or antidepressant medication. Let’s look at these in more detail. The typical treatments for patients with mild to moderate pain include non-steroidal anti-inflammatory drugs (NSAIDs) or other pain relieving medications. These are the over-the-counter medications like aspirin or ibuprofen that you’re likely already familiar with. If you’re suffering from pain from dental or sinus issues, it’s best to talk to a dentist or general practitioner. They can help eliminate the specific reason for your pain. For example, a dentist can perform a procedure that eliminates pain associated with an injured tooth that is causing face pain. Conversely, a physician can prescribe certain medications that help to clear a sinus infection that may causing pressure or other pain in your face. Other, more specific causes of face pain such as temporomandibular joint disorders may be relieved with exercises and mouth guards. If your pain is unresponsive to at-home care or alternative therapies, you may want to talk to a specialist. There are treatments that can help. For example, occipital nerve blocks and sphenopalatine ganglion blocks can help block the pain caused by inflammation of the trigeminal nerve. Other treatments, such as peripheral nerve stimulation and spinal cord stimulation may be warranted in more severe cases. Finally, botulinum toxin type A (or Botox) can also help relieve pain from trigeminal neuralgia or severe migraines. Likewise, your doctor may prescribe muscle relaxants, anti-depressant medications, or other pain medications to help manage the pain. In only the most severe cases do doctors recommend surgery. If that’s the case for you, working with highly-trained surgeon can help you reduce your pain. To help create movement and expression, your face relies on a complex structure of nerves, blood vessels, glands, and bones. Any of these, when damaged, can lead to pain. Although face pain is often widespread, there are several treatment options that can provide effective relief of both mild and severe face pain. Your first and most important step is talking to a doctor. They can diagnose the cause of your pain and suggest treatments that work for you. You can find a pain doctor in your area by clicking the button below or looking for one in your area by using the tips here: https://paindoctor.com/pain-management-doctors/.